Try this exercise if you're afraid your conflict is lagging! 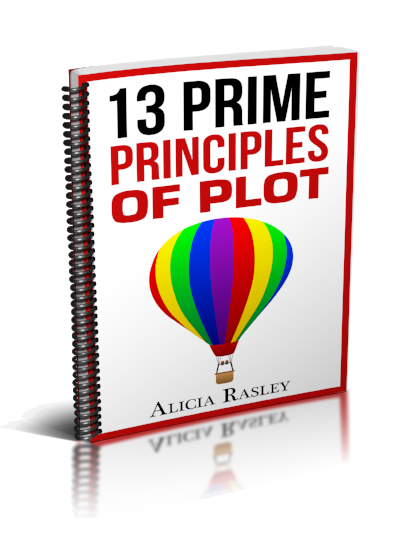 This uses the 3-act Structure to organize your plot events into setup, rising conflict, resolution, and that structure provides propulsion and the progression of events within the story arc. Willy-nilly eventing won't build up the dramatic power that intensifies the emotion. In fact, effective plotting is all about cause and effect. Events matter because they cause something else to happen and something to change and the characters to feel. The accumulation of events is what propels the reader to read on, and organizing this cause/effect sequence into acts will help you build tension and cause change. Act 1 -- Set up conflict. Act 2 -- Make conflict rise. Act 3 -- Make conflict explode, and then resolve it. Just try it-- ascending risk, remember! Then consider: What are the risks he/she is afraid of? Why is this a risk? What might this risk cause, and what might be caused by their trying to AVOID the risk? For example, let's take one that is just full of emotion-- secrets. Three secrets. Kept or revealed? Or both? Maybe the attempt to keep a secret leads to revelation. Act 1: This sets up the first secret. She's an FBI agent, and she's sent undercover into a small town. So the first secret is that she's secretly an FBI agent. There's not a lot of emotional risk in this secret because it's her job. But it sets in motion all the rest of the risks. What does this cause? It causes her to be placed in this small town to investigate the local bank, and it causes her to have to take on a disguise—she's pretending to be a bank teller. Act 2: The next secret comes when she meets and is drawn to the son of the bank president. This is just the sort of guy she despised when she was growing up, rich and polished and educated. But she's supposed to investigate his father, and she's supposed to be a bank teller who would be flattered by his intentions, so she has to keep the secret from him about who she is... and the secret from her boss that she's falling in love with one of the "targets". What does this cause? She's getting deeper entrenched into deception. It's going to be far, far worse now when her secret is revealed. She's also becoming alienated from her job, from her old self, from the FBI, as she's not reporting her contact with Junior. Maybe she's even started lying to her boss, withholding information that could get Junior in trouble. Act 3: What's the final secret? It's probably her real identity, not just FBI, but her former identity. Maybe she's never told anyone that she grew up as "trailer trash," the daughter of a small-town prostitute or drug dealer. Her final secret is her shame, which has caused her all along to hide her past and her true self, to cut herself off from her old friends and her family, maybe even to make up a more generic and acceptable past. REMEMBER TO TRY AND ASSEMBLE THIS IN "ASCENDING ORDER OF EMOTIONAL RISK." THE RISK OF THE LAST SHOULD BE THE GREATEST RISK TO THE CHARACTER'S EMOTIONAL SECURITY. SO IN THIS CASE, WE'RE SEEING THAT THE BIGGEST SECRET IS HER PAST, AND THE GREATEST DANGER IS SHAME. Let's try another "Three Acts, Three Somethings." Remember the film Casablanca? Rick is a symbol of the United States before Pearl Harbor, isolated, uninvolved, as the world crashes around him. Act 1: Ugarte asks Rick for 2 things—to hold the letters of transit for the evening (he agrees), and later to help him escape from the police (Rick refuses this time). What is the risk? There's some emotional risk from refusing to help—a few hours later, he drunkenly refers to it—but he can shrug it off as kind of a cost of doing business—sometimes, to run a successful saloon, you have to sacrifice a friend. Act 2: The news of his having the letters spreads, and he's approached by Victor Laszlo, a Resistance leader who will be arrested by the Gestapo if he can't get out of Casablanca. When L offers to buy the letters (which will get him and his wife to safety—do NOT ask why! Because, that's why. These are magic letters :), Rick refuses, and when asked why, says bitterly, "Ask your wife." Much more emotional risk here! In refusing to help, he is acknowledging that the wife (Ilsa) hurt him earlier, and he's using this as a means of revenge. His hard-won isolationist wall is beginning to crumble. Also, weirdly, he's sort of letting himself hope that Laszlo will find out about the earlier affair and cast Ilsa out so that she will come to Rick again. For Rick, this causes him to get more and more involved in Ilsa's dire situation and make it that much clearer that he's still in love with her. Act 3: Ilsa herself comes to him and asks for—no, demands—the letters of transit to save Laszlo so he can continue to fight the Nazis. She is so determined that she pulls a gun on him, and he is so determined to refuse to help her, that he invites her to shoot him. Rather than help her, he will commit suicide! Talk about emotional risk. Helping her would be worse than dying? The real result is Rick's return to the family of man, actually. He accepts responsibility for other people, and joins the war effort. He gives up his isolation and accepts the power of love. Notice that a powerful place to put 'the thing' is close to the end of the act, so that its repercussions propel into the next act. So look at your own story, and see if you can identify "Three Things", or invent them, and center each act upon this thing. 1. What is the "thing" in "Three Things" in your story? If you'd like to speculate about what this means, how it relates to a deep internal issue or theme (like Rick's refusal to help is an aspect of his fear of getting too involved again and getting hurt), have at it. 2. Where can you put some manifestation of "this thing" in each act? a. What is the emotional risk here (and remember to assemble these three in ascending risk)? b. What does this thing cause to happen? 3. How can this thing near the end of the story (maybe the dark moment?) cause a great emotional change? Older PostQuick Journey to Plot Exercise: Your Turn!